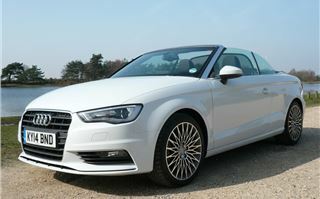 Audi can’t complain if I call the A3 cabrio a hairdresser’s car. My hairdresser has one. However, she doesn’t have the vastly improved 2014 model with a bigger 320 litre boot that makes it a practical proposition for two adults and two kids to take on holiday. Its most charming incarnation is the 140PS 1.4TFSI ACT with ‘cylinder on demand’ technology. 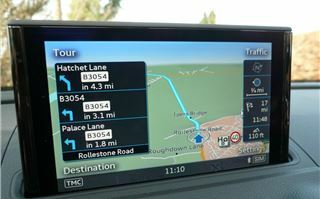 And that also just happens to be the cheapest at £25,790 on the road, before you start adding any options. Inevitably, ‘our’ car did have options, such as ‘Sport’ trim that adds £1,225; 18” multi-spoke Star alloy wheels with 225/40 R18 tyres in place of the standard 17s with 225/45 R17s at £595; the ‘Technology Package’ of satnav and Bluetooth at £1,795; the ‘Comfort Package’ of wind deflector, auto dimming mirror, rear parking sensors and cruise control at a bargain £300; and some other bits and pieces that hiked the price to £32,065. 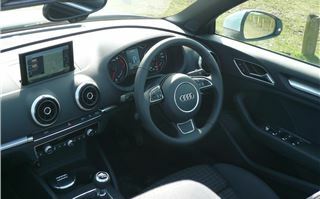 As David has mentioned before in previous road tests, the 1.4TFSI 140 ACT is a remarkably pleasant and relaxed engine to drive. With 250Nm torque from 1,500-3,500rpm it pulls cleanly from low revs. And on the overrun, when descending an incline, the valves of two combustion chambers close, so they use no fuel. Audi anticipates that 30% of A3 cabrios will be sold with this engine, and only 2% with the more powerful 180PS 1.8TFSI, that the car doesn’t really need. You will also eventually be able to get diesels with 110PS, 150PS and 184PS. And a seriously quick S3 quattro cabrio with 300PS and 400Nm torque. 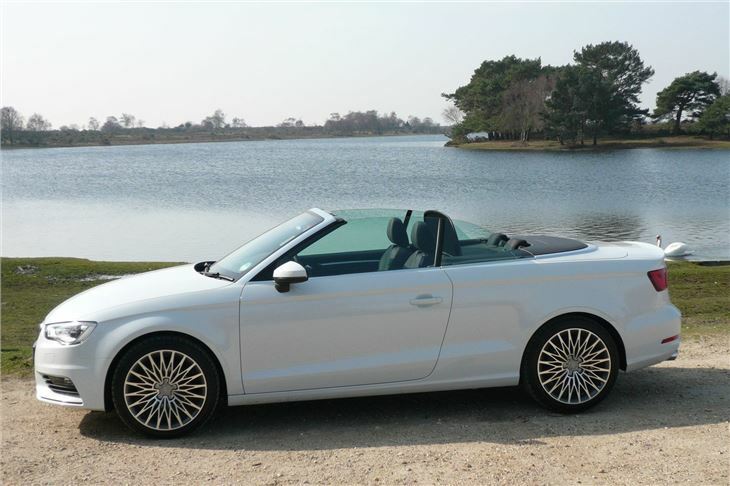 But I’d go for the 1.4 TFSI. 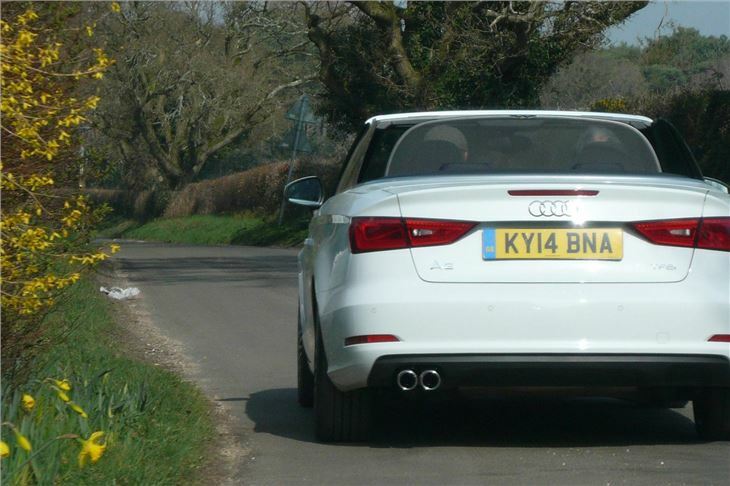 The A3 cabrio benefits hugely from the fully independent rear suspension shared with other high spec MQB platform cars. 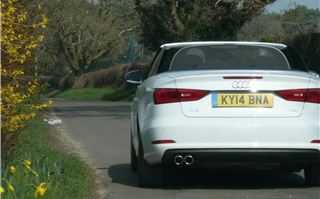 Even on the 225/40 R18s the ride of our car on potholed New Forest roads was not too bad. So, though the standard SE comes on absorbent 205/55 R16s, if you value a sportier feel, it might not be a mistake to specify the 18s. The front seats are very comfortable. Pull them forward a bit and you can fit a couple of children behind, or a pair of smallish adults, but forget about rugby players and Sumo wrestlers. 320 litres (hood up) is actually 4 litres more than the load capacity of a current model Ford Focus fitted with a spacesaver spare. And, if you fold the back seats down you can get 678 litres of stuff under the wind deflector. Top speed is 135mph, 60mph comes up in under 9 seconds, yet the combined economy is 56.5mpg, which suggests a real life 45-50, and annual tax for 2013/2014 is £30 (though that might go up next week). It can even pull a 1,500kg caravan. And for company drivers BIK tax is on 14% of the price. 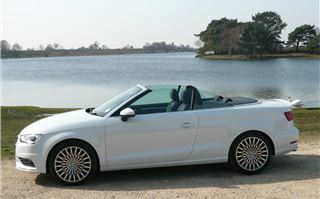 Of course, Audi was more than a little lucky with the weather. (Last March for the Citroen DS3 cabrio launch it was snowing.) So we were able to judge the car at its best. But I was certainly convinced. 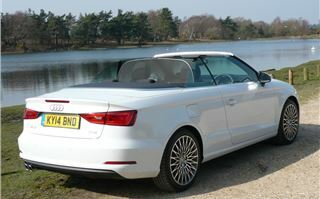 If I wanted a nice, high quality 4-seater convertible, the new A3 cabrio would be top of my list.